Flowers for Strawberry Hill House, our Stunning Hidden Gem! This year has been a big one at Strawberry Hill House! The fabulous home of Horace Walpole has seen a large part of his Gothic art collection returned to the House for an exhibition. The restored house is truly beautiful and with a large part of his collection back in place from galleries and private collections, it brings the house to life. I was very lucky to be asked to work on the floral designs for the opening night of the exhibition, particularly as Sir David Attenborough who is a patron, opened the event. Quite honestly, he could have just recited his twelve times tables in his speech and I would have been just as excited and thrilled to have been there! Luckily, it was dahlia season and these fabulous blooms were perfect in their varieties of shapes textures and colours. Sarah Whiting is a local flower farmer and I had the joy of being able to select stems myself from her wonderful array of flowers. We added some cosmos, amaranthus, some beautifully scented roses from The Real Flower Company and bracken for texture and that gorgeous earthy warm golden colour. The exhibition draws to a close in February and with or without the “Lost Treasures” , the house is definitely worth a visit. Orleans Gallery is such a pretty place for a ceremony… Ollie looked just gorgeous in her Jenny Packham dress and carried a loose tumbling bouquet of roses and beautiful locally sourced seasonal British blooms to compliment them in pastel shades… sweet peas, pinks, cosmos and ammi to name but a few. She had seven bridesmaids who each wore an individually chosen dress in green and their bouquets were all different too. After the ceremony they walked to The Secret River Garden, a real hidden gem on the river bank in Twickenham where a brass band played Marvin Gaye’s “Sexual Healing and really got the celebrations under way. They had a marquee in the garden which we decorated in garden style with a very large foliage installation as the focal point in the marquee, opting for arrangements of mostly foliage to echo natural greenery growing along the river bank. There were lots of really lovely touches; a swing area surrounded by tiny bottles of peach schnapps hanging by ribbons from the trees, a quiet chill out area with pretty silks wafting in the breeze and croquet to be played. The Secret River Garden is a real gem of a venue and Tom and Ollie’s was a gem of a wedding…..a real joy for me to work with them! 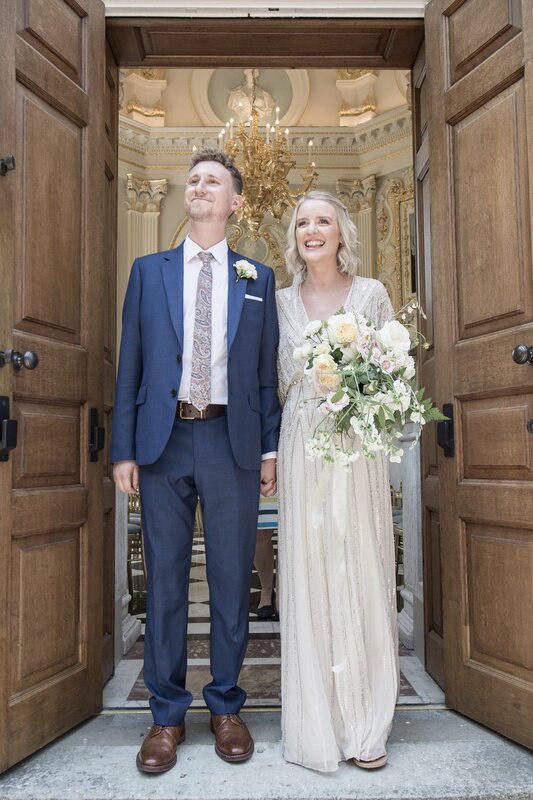 The Elvetham was once the home of Anne Bolyn and her family, set in beautiful landscaped grounds and the perfect setting for James and Juliana’s wedding. Juliana loves flowers and I’m happy to say, trusted me to create designs for their day, some of her favourites being the beautiful big blousy Cafe au Lait Dahlias with their tinges of blush and pink. 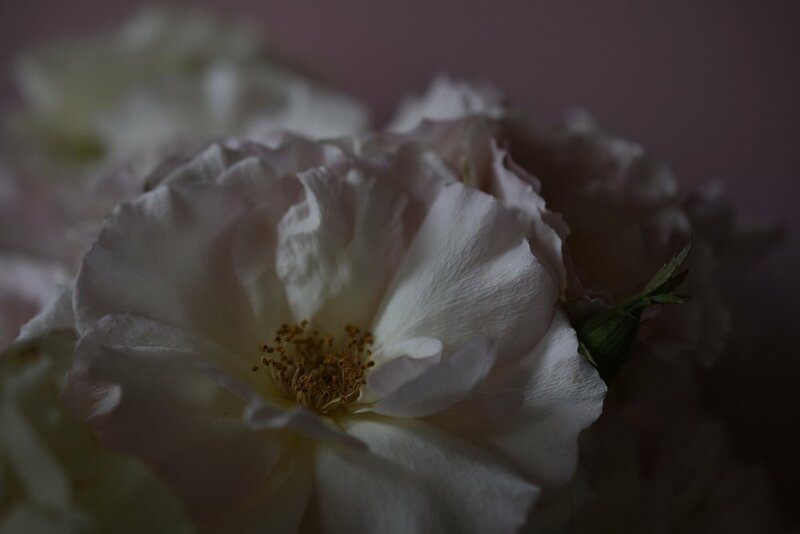 We chose exquisite British grown garden roses, foxgloves, scabious and ammi which we teamed with other locally sourced seasonal beauties to give variations of shape, texture and colour. I must admit to loving ammi myself, so it became a feature flower, wafting through all her arrangements. The hand tied bouquet was arranged in a natural style and bound with silk ribbon, containing some small delicate detailed stems to contrast with her elegantly simple dress….I loved creating floral designs for their wedding and needless to say she looked completely stunning! I have always been interested in how clever colour is and how it affects each of us. I love colour and as you’ll tell from my Instagram images, I love to see to colours being revealed from a dark background as the light catches them. It would seem that each of us perceives colour slightly differently as it works at a subconscious level and it’s no surprise that the feelings different colours evoke vary from person to person which explains why our favourite colours are not necessarily the same. Flowers and colour have a strong thread for me..... Before becoming a wedding florist, I studied botanical illustration later, working for a number of design groups in London. Colour has a huge influence on design and is quite a marketing tool, influencing people in their purchasing choices without them realising. Whilst at Art College, before learning how to paint, we studied colour and its nuances in great depth. Colour can make your heart soar, make you feel very calm or even create a feeling of uneasiness. Floral designers often use foliage in tones of green as a neutral colour base, a natural background for flowers. We spend time encouraging clients, especially brides to be brave and to go with colours that they love for weddings. It’s our job as floral designers to create something beautiful using nature’s amazing array of naturally occurring colours, each colour having it's own significance. It's a real joy to have many colours and flower types to play with. The colour that is most loved for weddings and is Instagram’s favourite in any form, is pink. A large bouquet of pink peonies can make most people extremely happy. In the West pink is seen as the colour of all things feminine. Interestingly it’s the reverse in other parts of the world. The Japanese rugby team aren’t called “The Brave Blossoms“ for nothing! So back to flowers!…..The reason pink works so amazingly well and looks so beautiful is because its complementary colour is a soft green and when you put them together, particularly a pink flower such as a rose and a stem of green eucalyptus of roughly the same colour weight, they enhance each other and are heart-breakingly gorgeous. No wonder it’s a popular colour, time and time again. I love pink myself but I love all colours and each is beautiful in it's own right, has it's own meaning and complementary colour, so go on, don't choose colours that you think you should, have colours that you absolutely LOVE for your wedding....it will speak volumes about your personality and style.